confidential. We therefore trust your discreet responsibility. Waste is broadly defined by the Department of Water Affairs in 1994 as: “an undesirable or superfluous by-product, emission, residue or remainder of any process or activity’. 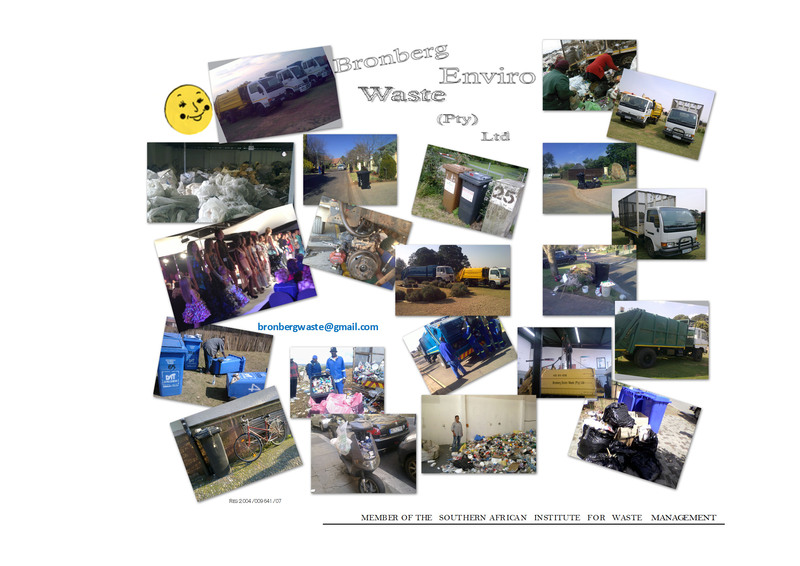 Our approach is to view a client’s waste holistically, that is, to endeavor to deal with the entire spectrum of issues and challenges surrounding a client’s waste. Client’s, on the other hand, need to view their products holistically as part of product stewardship, for by law, clients remain responsible for their products from ‘cradle to grave’. An integrated approach to waste management should therefore take into account the full life cycle of a product, including the impact from manufacturing processes, product use and final disposal. The Institute of Waste Management for Southern Africa, which embodies all registered service providers, is endeavoring to accelerate the Recycling National By-laws. Until such time the client (source) is responsible for implementing their own program with the assistance of preferred service providers. Our workforce is under constant supervision & conducts its work within the Municipal by-laws. Stock is purchased from a SABS approved supplier with a five-year warranty. Life expectancy of the containers is 16 years before replacement and excluding vandalism i.e. no ash allowed, removal of wheels / unauthorized painting or markings on bins etc. We recycle and if you wish to join in the program please call us for an upfront meeting to discuss your needs and requirements. Also consider “at least 75 percent of hydraulic-system failures and maintenance actions stem from contaminated fluid and not releasing fluids from compacted waste.’ According to the service centre in Pretoria West Mr. Anton Kotze, ‘solids are the most common and damaging’. He continues, "These can be either hard, such as metals, motor oils being mixed with solid waste and dirt. Residential green waste contributes to overflow when compacted especially in summer or when water is tipped! Your weight count at the weigh bridge confirms this. Therefore the account during the 7 summer months is more strenuous on your vehicles!’ Residential vehicles average 1,200 stops a day, driving up to 200mi.per 10-hour shift.